A SPA IN YOUR OWN HOME!! Steam Planet's Luxurious shower and steam systems are equipped with everything you need for total and complete relaxation. The multi-jet shower enclosure comes with an ultra quick heating 3KW steam generator, multiple body massage jets, a drenching 8 inch wide Rainfall shower head, and a hand held shower head with adjustable settings for many different water spray patterns. additionally, the multi coloured led lights illuminate the aroma therapy filled steam to create the ultimate relaxation experience. Quick heating steam generator complete with control panel, temperature sensor, and a chrome finished aromatherapy steam outlet. Everything you need for your own luxurious steam room. A SPA IN YOUR OWN HOME!! Steam Planets shower and steam systems are equipped with everything you need for total and complete relaxation. The multi-jet shower enclosure, comes with an ultra quick heating 4.2 KW steam generator, Multiple body massage jets, a drenching 8 inch wide Rainfall shower head, and a hand held shower head that has adjustable settings for many different water spray patterns. It also comes with a Wireless media center that allows you to play your favorite music, talk shows, sporting events, etc.. from the radio, MP3, CD, Ipods , and even your cellphone, Additionally, the multi coloured led lights illuminate the aroma therapy filled steam to create the ultimate relaxation experience. A SPA IN YOUR OWN HOME!! Steam Planets Luxurious shower and steam systems are equipped with everything you need for total and complete relaxation. The multi-jet shower enclosure comes with an ultra quick heating 3KW steam generator, multiple body massage jets, a drenching 8 inch wide Rainfall shower head, and a hand held shower head with adjustable settings for many different water spray patterns. Additionally, the multi colored led lights illuminate the aroma therapy filled steam to create the ultimate relaxation experience. 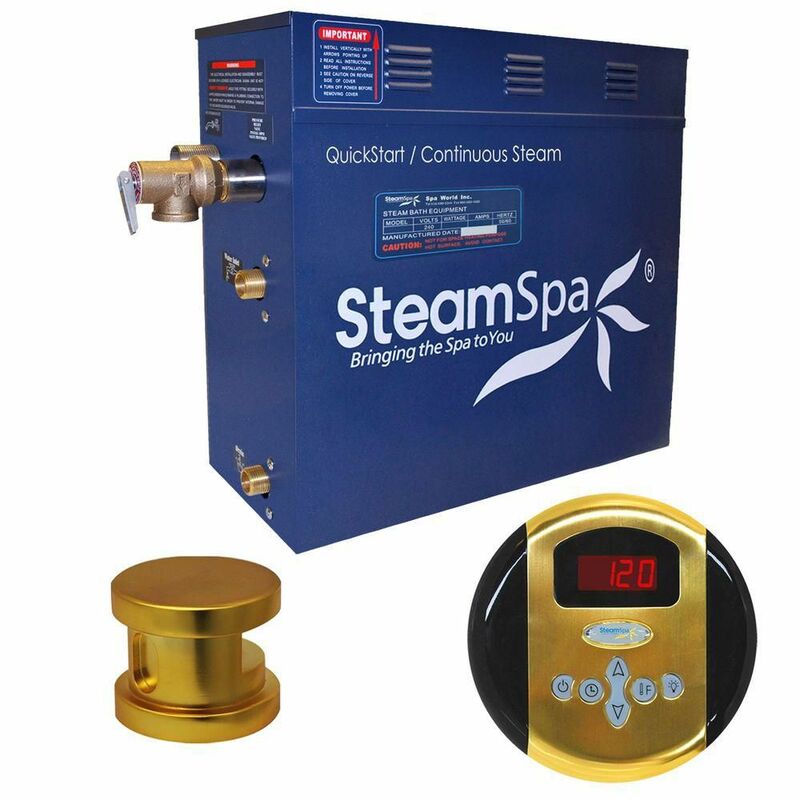 Oasis 6kw Steam Generator Package in Polished Brass The perfect steam sauna experience is exactly what we had in mind with SteamSpa steam generator packages. Easy to install and even easier to operate these steam generators produce a consistent flow of soft and soothing steam thanks to the cleverly designed dual tank technology while minimizing any distracting operational noises. Compact in size and design they also feature the Auto Drain system that aids in making maintenance easier by purging the generator of any excess water/minerals that would later contribute to issues down the line. All in all you get a safe, quite, reliable, luxurious steam sauna experience with our compact powerhouse of a steam generator. Adding to the luxury empowered by the generator are the wonderful accessories included which will aid your relaxing steam experience in finishes creating a thoroughly holistic sauna decor.